Were out again today, might won't get this chance after tomorrow, I feel that my internship gonna kill my cells and energy rapidly. Laugh out loud. I really need to get a GPS once I got money, I can't even remember a place correctly, how pathetic, as I've been staying in this cozy island for 23 years. Smack head. Were so thirsty and we went to U Soya to satisfy our thirsty. First time to step in this place although I had pass through this place for hundreds time. Read this: Leadsafe for a healthier living; they mean soya. 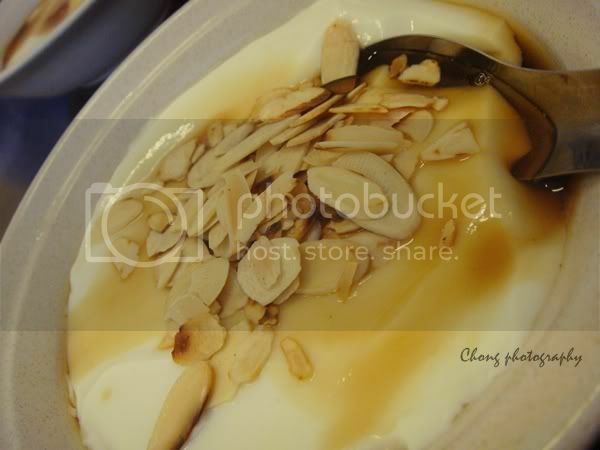 Ever try the soya custard with topping? I tried the almond topping but I still prefer the original one, simple is always more than enough to allure my taste-buds. Went to another place to get the same thing, just to compare which one is nicer; the roadside soya is much more better! Healthy today. The first ever family dinner once I were back in here, Sakae Sushi at Gurney Plaza, and we enjoyed the shopping moment. Were so regret that I didn't get the jeans I tried, it is nice on me (my thought), wait me and I'll get it pretty soon! You never know, little things mean a lot to me.